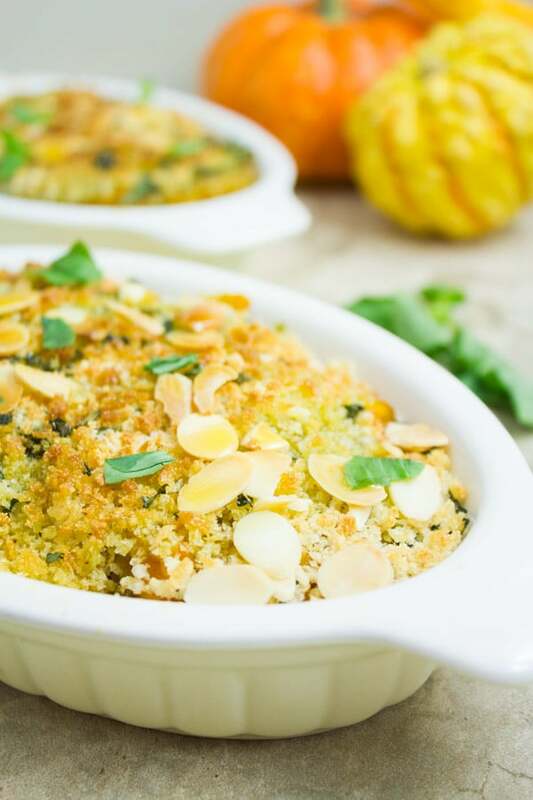 This easy Butternut Squash Gratin features tender, basil pesto flavored roasted butternut squash with a basil crunch almond topping. The perfect Thanksgiving side dish, ready in just 20 mins. Happy Thanksgiving!! 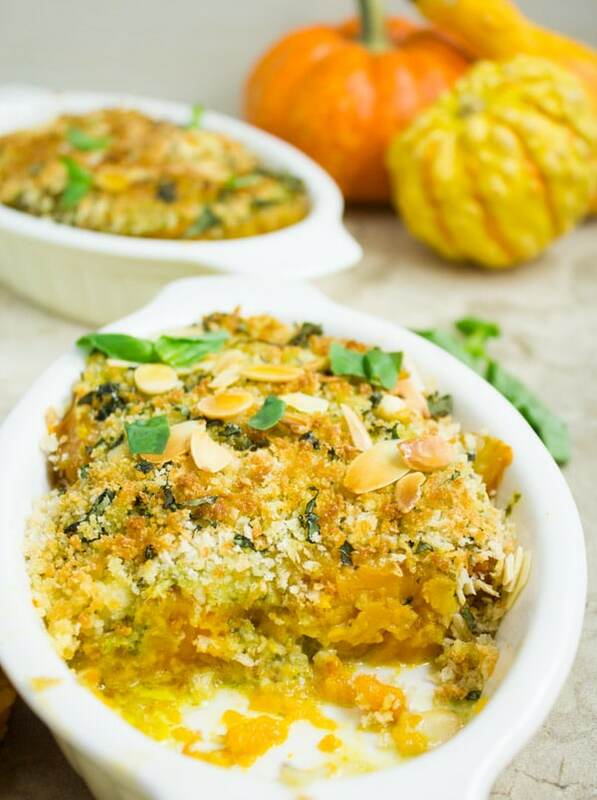 If you’re a last-minute person, this easy Roasted Butternut Squash Gratin Recipe will be a lifesaver for you! It’s as simple and straightforward as can be, and it’s super delicious. 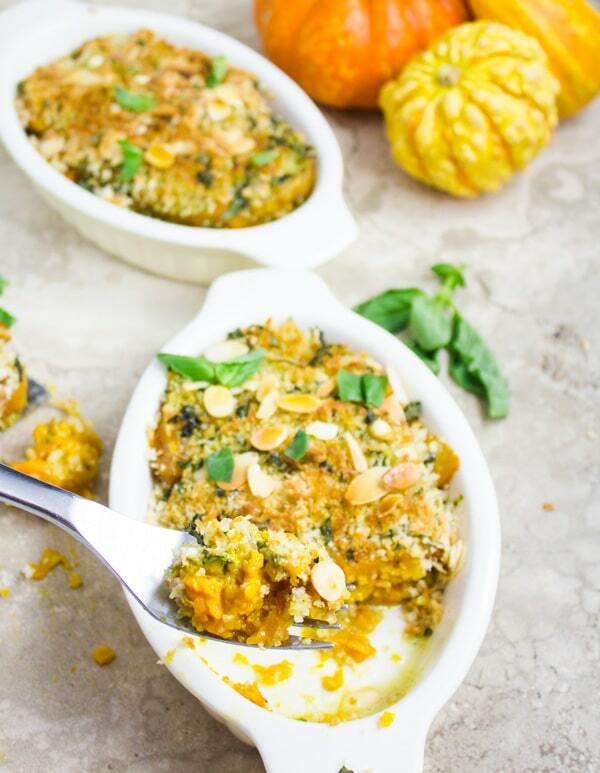 Tender, basil pesto flavored roasted butternut squash with a basil crunch almond topping, ready in 20 mins for a perfect Thanksgiving side dish. Make the most of squash season, it goes by fast! More Thanksgiving and Holiday goodness here. 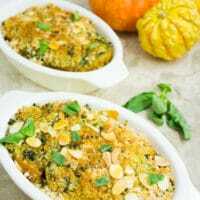 I love simple, light side dishes like this butternut squash gratin. And, holiday season aside, a lovely roasted butternut squash gratin like this with a nice salad will always make a perfect lunch/dinner for me. This butternut squash gratin is one of those make-ahead, freezer-friendly meals that make life easier. For today, I’ve based the flavor on basil and basil pesto. But feel free to personalize this gratin recipe completely to your taste! That’s the beauty of food, in my opinion, all you need is a technique or an idea, and go from there with the flavors you love! So I LOVE butternut squash. Just Love it. One of my favorite recipes using it has to be this amazing Mediterranean Pear Cinnamon Squash Soup (a Spanish Moroccan fusion recipe) and this pure comfort Squash Basil Amaretti Lasagna . Despite all that love, I will still mention that you can use any type of squash/pumpkin for the gratin. Actually, any type of veggie—that’s how versatile it is. If you’re not familiar with the term gratin, it’s as simple as a baked *something* which could be veggies, eggs, fruits, meats..etc. topped with a crunchy crust. Some gratins involve a nice saucy bechamel sauce (veggie, or veggies and meats) with a crunchy topping, while other gratins are a simple no-sauce affair with a crunchy topping. Either way, gratin always impresses with a great contrast of textures—that soft and crunchy contrast is unbeatable. Now, for this Crunchy Sweet Potato Gratin recipe, I make a simple flour topping. 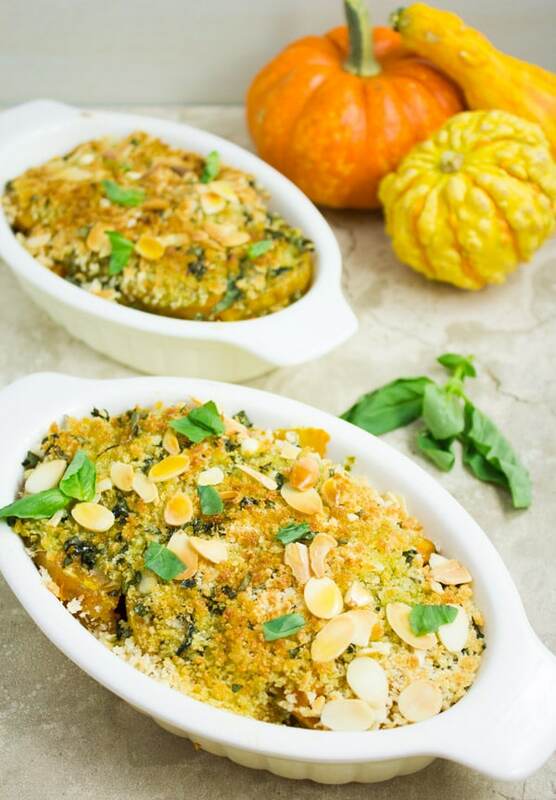 You can absolutely try that topping with this roasted butternut squash gratin too. I’m going with a quicker breadcrumb topping today so you get a chance to see both options and compare. I’ll quickly share how this gratin recipe comes together. I LOVE roasting the butternut squash before assembling the gratin. I do this for a few reasons. First, I get a deeper sweeter more flavorful squash. Second I can roast a whole bunch of squash at the same time, then use some for the gratin, use the rest for s soup or just freeze it for a later day. And thirdly, the gratins cook much faster when the squash is already roasted. That being said, you can very much make the roasted butternut squash gratin with raw fresh squash and have it all cook together in a one pot meal. Once the butternut squash is sliced and roasted, you’ll layer it in an oven-safe dish. I prefer making them in individual servings like this. They cook faster and feel more personal. But if I’m making this for a crowd I would opt for a large 3-quart baking dish. Now I chose basil to flavor the squash—it’s totally up to you which herb you pick. 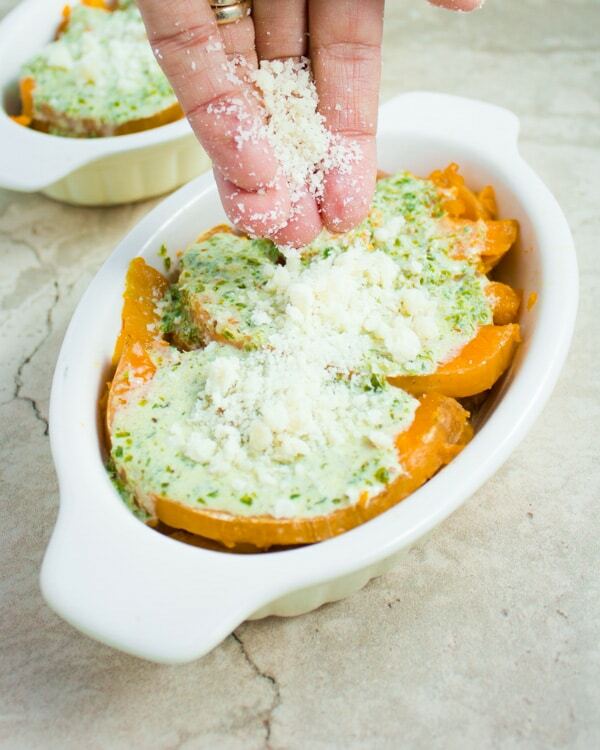 I happen to love the basil and squash combo and simply drizzle a mixture of basil pesto and cream over the squash. 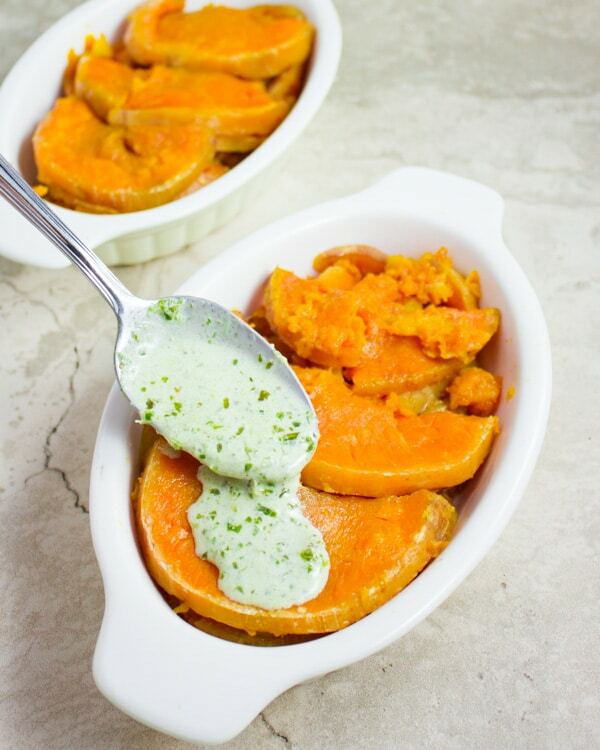 This basil mixture adds flavor and some creaminess to the squash. Then I top the roasted butternut squash with a combo of panko breadcrumbs, parmesan cheese, almonds, and more fresh basil. A tiny drizzle of olive oil over that and they bake for just 8 minutes until the tops are nice and golden. One bite tastes like sweet squash, sweet basil, parmesan, and basil crunchy breadcrumbs. Pair this with a salad, a roast/grilled type of meat or fish and it’s a perfect meal! 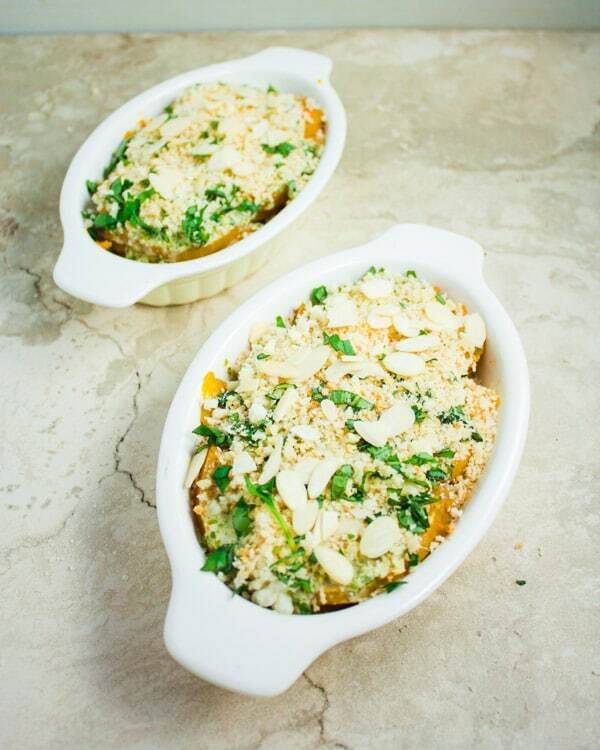 Can I make these roasted butternut squash gratins in advance? Yes, these roasted butternut squash gratins can be prepared in advance. Squash can be roasted and kept in the fridge for unto 5 days and in the freezer for up to 3 months. The gratin assembled and ready for baking can be prepared 2 days in advance or frozen as it is for 2 weeks before baking (just bake for 5 mins longer). Or bake the gratin and when it’s cooled down, freeze it and later reheat it in the oven. Super simple, easy and flavor-packed food—Pure LOVE! Make these and enjoy. Have a Happy Thanksgiving!! These butternut squash gratins cook much faster when the squash is already roasted. That being said, you can very much make them with raw fresh squash and have it all cook together. As a variation, you can use the topping I use in this Crunchy Sweet Potato Gratin recipe. I’m making this gratin for a crowd I would opt for a large 3-quart baking dish instead of individual ramekins. Preheat the oven to 425 degrees F. Spread the butternuts squash pieces in a single layer and season with salt and olive oil. Toss them well in the seasoning and roast the squash for 12 minutes until tender. Use a large 3-quart oven-safe dish or 6 ramekins (8-ounce capacity) or 10 ramekins (6-ounce capacity) and layer the squash slices or cubes at the bottom of the dish. In a bowl mix the basil mixture ingredients and drizzle that over the squash evenly (it will not cover the squash entirely). Sprinkle the Panko mixture over the squash and then bake the gratin for 8-20 minutes (depending on the size dish you chose) until the tops are golden and crunchy. This is really up your alley with textures!! 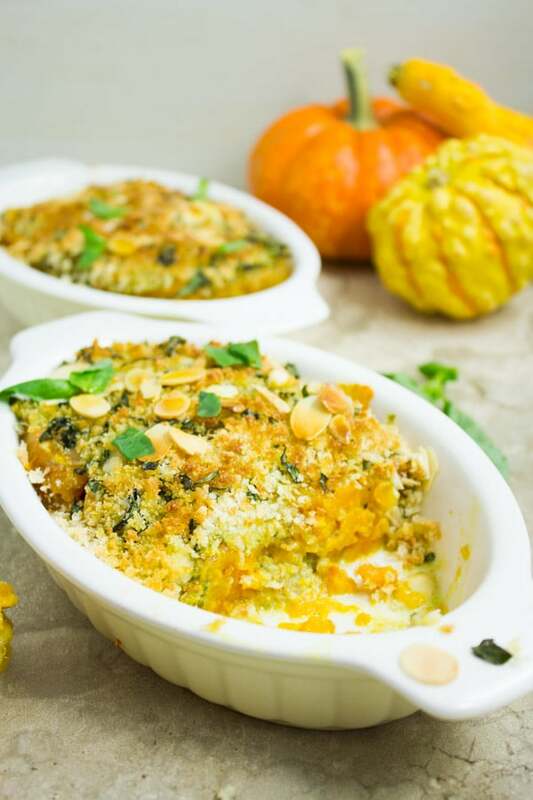 What a great idea to use butternut squash in a gratin! I love that crispy topping and all the flavors you have in here! Oh, I love roasted butternut squash with such crumble topping. This looks so yum. My favorite is the parmesan. I love gratins and using butternut squash instead of potatoes would be wonderful for Thanksgiving. What a great idea to use pesto to help season the squash. And adding a crunchy topping is always a winner in my book. 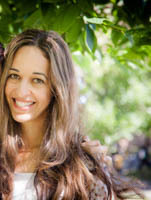 Hope you try it Marisa! I think basil pesto and butternut squash were meant to be. This looks like a great gratin dish that I would love to make for the holidays. I’m all in squash and pumpkins lately so this recipe looks irresistible to me. So delicious. I love all the flavors and how easy this is to make. I bet my whole family will love it to. Saving the recipe.